Pitzush’s owner Roxana Dulama, from Romania, rescued her feline friend eight years ago when she was a neglected, homeless kitten and in a critical condition. Dulama nursed the kitten back to health, and has since built a large online following for Pitzush. 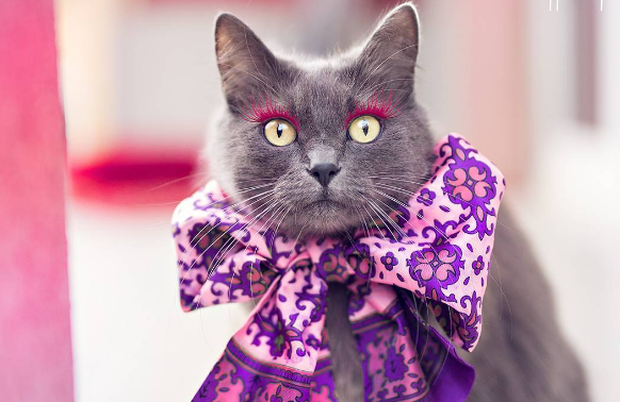 She uses Photoshop to insert colourful eyelashes on the slate-grey cat, as well as dressing her in vibrant flower crowns, jewels and ensembles. However, there’s a surprising reason that Dulama dresses up her pet. "I started dressing Pitzush because I thought that so many women in fashion aren't good role models for young women — and they end up getting body conscious," she told the Daily Mail. “I usually make her costumes out of my old clothes and Photoshop on the eyelashes - despite what some people think,” she said. Pitzush’s Insta-fame seems to have gotten to her head, however, with Dulama saying she can be quite a diva. So grab your camera and get snapping, your cat could be the next Instagram star.